My SMS inbox floods with unwanted messages which I need to delete manually to find my own important personal messages. When I am fully busy with official work, my mobile rings with unknown number and when I lift the call, the story is again same. Call from telemarketers ! Like me, millions of mobile phone users in India might be experiencing the same problem intermittently. Is there any solution to the problem ? Can we have any regulatory mechanism from government ? The answer to those haunting question is here. 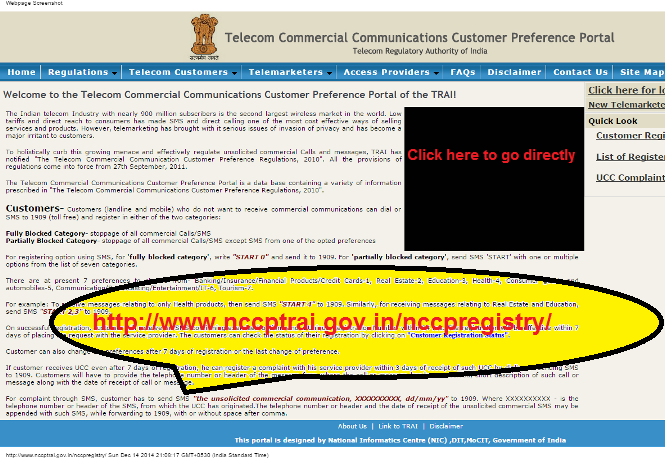 Telecom Commercial Communications Customer Preference Portal under Telecom Regulatory Authority of India of Govt. of India solves all your problems relating to unsolicited calls & SMS. The detailed procedure to register your complaints is elaborately given there which helps to overcome the nuisance. Jet, set, go !